Which bass lure offers more options than any other lure? Spinnerbaits of course. An angler can take blades and skirts of different sizes and colors and produce any kind of look he wants for this lure. If the bass are not biting one look then change it up and try something else. Or just have many combinations already handy. You can purchase skirt making kits and extra blades online at tacklewarehouse.com. Because the skirt billows out and kind of shields the hook, they are pretty much weedless during retrieval. Ok, first let’s talk about what spinnerbaits are made of and why they are made to look a certain way. All these parts are assembled together on a thin wire. The wire is bent into a shape that, when all the parts are lined up, looks like a bait fish. 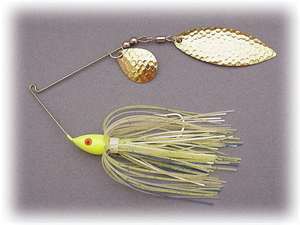 The combination of colors of the skirt and the blades together with the shape of the wire should produce an image of a fish the bass would eat, such as a bluegill or shad. Now let's talk about each part and their different looks. The blades play a major role for the spinnerbait. There are three different shapes. Colorado blades are round like a big moon, deep like a crater and makes a lot of noise and vibration. This means the bass can hear the lure swimming through muddy water. He knows where his next meal is located without actually seeing it. Willowleaf blades are easier to pull through vegetation because they have a long narrow shape. Spinnerbaits with this type blade are used in clear water because they have more flash that the bass can see. Indiana blades are also known as Oklahoma blades. This one is a marriage of the Willowleaf and Colorado blades. It has been described as looking like a tear drop. Pulling this blade through the water will produce both flash and vibration. The size of a blade affects the way the lure behaves in the retrieve. Large blades create more drag and thus more vibration. Small blades create less drag and are easier to “burn” through the water. I guess size does matter! Skirts are another major element of the spinnerbait. Along with the blades, skirts add body, color and movement. They are made of rubber or silicone. Actually, not so much rubber anymore because rubber melts in high temps. Leave one in the bottom of an aluminum boat in the summer time and see what happens. Silicone is used more now because it resist melting. You can modify a skirt by trimming some or all of the strands. Another option is to pull some the strands completely out. How you want the skirt to look is really up to you. So always remember this. The object of the skirt is to have the color and motion of something a bass wants to eat. Head weight depends on how deep you are fishing, water temp and water clarity. Weights vary from 1/8 ounce up to ¾ ounce. If you are fishing in shallow stained water then a 1/8 or ¼ ounce head weight will work. If you want to go deeper where the big bass live in hot weather then a ½ or ¾ ounce will do the job. The wire is what holds everything together. It is also called an arm and is referred to as either a “long-arm” or “short-arm”. Long arm spinnerbaits are more effective when cranking in shallow water. A fast retrieve or a “burn” is used a lot in shallow water. Short arm spinnerbaits are ideal to use when allowing the lure to spiral down or “helicopter” in deeper water. Casting the bait against standing timber and letting it fall or spiral down the length of the tree trunk is an effective technique in deep water. Another effective technique is the “slow roll”. This is simply using a slow retrieve and allowing the spinnerbait to bump along the bottom. As you can see, the spinnerbait is a versatile bass lure that can be used any time of the year. It is a good idea to have different colors and sizes in your tackle box arsenal.